Call us at anytime. Day or night. We serve customers 7 days a week. Looking for: Construction Cleaning company in London? 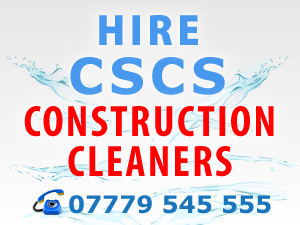 Hire CSCS cleaners for any construction, builders & Sparkle cleans in London. Cleaning Cleaners has been provided construction cleaning services to companies, private individuals and organizations all across the UK. Our cleaning staff have the experience, knowledge and all the resources to fully handle any size construction cleanup project anywhere in London. All our Construction cleaners are CSCS card holders & have full PPE (boots/hard hat/high vis vest). We can provide on-going regular construction cleaning & maintenance program to keep your construction site (project) looking it's best day after day. Our Construction & Builders Cleaning teams understand the pressure of working to a deadline and are prepared to do what it takes to complete the project on time. Cleaning Cleaners specializes in all phases of construction cleaning work, during and after the project. So if you want your construction project to look it best, give us a call at 07495 386 472. CleaningCleaners - HOME | About Us | Prices | Testimonials | Cleaning Resources | Sitemap | Contact Us © 2009-2011 Cleaning Cleaners LTD, All Rights Reserved.